When you look back through the history of games, there’s often a moment in time where a series of events or slices of luck play a part in a single game or a franchise making it big. For Pokemon GO it was a free-to-play game that capitalised on past popularity and unlimited reach through mobile devices. Halo captivated us with a stellar narrative, powerful technical prowess and a multiplayer that grabbed hold of a console audience. Mortal Kombat broke through with extreme violence, Mario introduced us all to 2D platforming and the original Legend of Zelda hooked us with a world so deep it was begging us to explore every nook and cranny. So how did Monster Hunter, a game with little to no influence in the west barring a few handheld titles and appearances on the PS2, Wii and Wii U take off? All signs pointed to this years’ Monster Hunter World releasing to solid if unspectacular reviews like previous titles and maintaining its niche audience in the west. In the gap between Monster Hunter’s last foray into the home console market in the west in 2013 and the release of Monster Hunter World this year, something happened. A shift in how we as gamers play games, amongst other shifts in our psyche, allowed it to permeate into our hearts and minds. Revealed with little fanfare in amongst the perceived bigger titles at E3 2017, Monster Hunter World charmed for the few brief seconds that it was shown off on PlayStation’s main stage. Sandwiched in-between a Shawn Layden intro and The Shadow of the Colossus remake, it showed not just a game but a franchise that had taken a leap in not just graphics but also personality and appeal. It brought epic monster battles with lighter tones to show that World had evolved from the often mindless (on the surface at least) games of yesteryear. Most importantly, it appealed to people who never knew what a Monster Hunter game was. As E3 came and went though, it became abundantly clear that World would not be appearing on a Nintendo platform. An ecosystem that became synonymous with the franchise over the last few years. From 2005’s Monster Hunter G, Capcom’s series has been intrinsically linked with Nintendo, releasing numerous Monster Hunter titles on their platforms for well over a decade. So the absence of Monster Hunter World on both the Wii U and the Switch came as a bit of a surprise, but perhaps not so, if you trace World’s development back to its beginnings. The goal for Monster Hunter World was to fully establish the franchise in a more realistic and lush looking world, taking advantage of the graphical prowess of both the PlayStation 4 and Xbox One. It was a time where the PS4 Pro and the Xbox One X were being touted around to developers as PS4 Neo and Project Scorpio while the Wii U’s star was fading fast – if it ever glimmered at all. The Wii U wasn’t able to meet Capcom’s lofty internal goals and vision for the future of the series and at the time, Nintendo’s next foray into hardware was seen by the industry at large with trepidation. The Switch’s early success didn’t change Capcom’s approach to the new Nintendo system either, with no support at launch. Capcom looked to test the water in order to gauge the system’s potential, releasing Ultra Street Fighter II – a title that gave Capcom minimal risk and an opportunity to gauge how their games might do on the console. It surpassed expectations, so much so that Capcom hurriedly readied Resident Evil Revelations and Revelations 2 for the Switch, releasing them just months later. It took the industry as a whole a few months to realise, but Nintendo’s new console wasn’t just making up the numbers, it was improving the bank balances of developers and publishers exponentially. Hindsight’s a wonderful thing and if Capcom could have gone back, there’s little doubt that they would have explored numerous options for getting Monster Hunter World onto the Nintendo Switch, even though it would have been technically inferior. Even a few months after launch, there is still a clamour from fans for Monster Hunter World Switch; so much so that CEO of Iron Galaxy, Adam Boyes, has offered his team’s services in order to port Monster Hunter World to the Nintendo Switch. Did Monster Hunter Kill Destiny 2? During the time of Monster Hunter World’s release, many players professed that they had migrated from Destiny 2. Bungie’s space shooter was highly anticipated upon release in late 2017 but like the original game, failed to match the expectations of fans. Many speculated that the correlation between the release of Monster Hunter World’s impressive numbers and the early 2018 fall of Destiny 2’s player numbers were linked. Did Monster Hunter actually kill off Destiny 2 though? “Personally, no.” Says Woulfe Condra, founder of Adopt-A-Hunter which gives newcomers to Monster Hunter a hand from veteran players. While it’s uncertain whether Destiny 2’s troubles were exacerbated by the release of Monster Hunter World, what’s certain is that the looter experience that Destiny introduced to so many players with the original, helped to prepare newcomers to the Monster Hunter series. Introducing them to the inherent idea that killing monsters in order to gain better loot to then go and kill stronger monsters to then get even better loot was a gameplay hook that could be enjoyed again and again. It’s this mechanic that saw so many play the original Destiny’s limited content over and over again. Arguably preparing them for Monster Hunter World. While Monster Hunter has certainly been a leader with this kind of mechanic in the past, it was the original Destiny that managed to introduce it in a popular way to console players and in a way, prepare them for the loop of Monster Hunter World. Monster Hunter World probably didn’t hurt Destiny 2, but Bungie’s original game certainly made Monster Hunter more accessible to the masses. A good amount of press coverage combined with a lack of any real competitors at the start of the year allowed Capcom to be optimistic about how well Monster Hunter World might do. They probably weren’t anticipating what happened though. 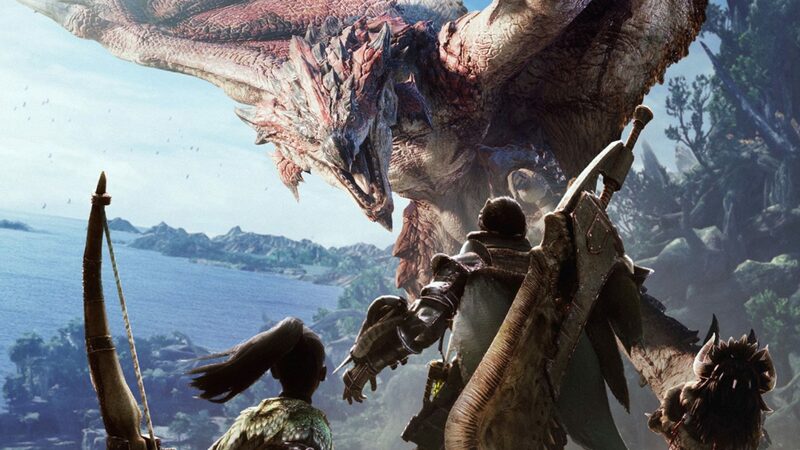 Monster Hunter World not only broke all internal projections at Capcom in terms of sales figures, it also broke franchise records in the West and became Capcom’s best selling game of all time. Shipping a gargantuan 7.5 million units within its first month on sale – with most of those actually selling through to customers. A result which meant that it had broken records and achieved a level of success that Capcom’s stronger franchises, like Mega Man, Street Fighter and even Resident Evil have not been able to replicate. It was a level of success that wasn’t anticipated, even in Capcom’s wildest dreams – especially in the West where the game has routinely failed to appeal beyond its niche audience for a number of years now. With most games these days though, the increasing importance of longevity will determine how it will be spoken about in years to come. A repetitive loot game that keeps players coming back for more has the potential of becoming a gravy train for Capcom, firmly establishing Monster Hunter as its premiere brand. How can Capcom do that though? The expansion of Monster Hunter into the west has recently seen the announcement of Monster Hunter Generations Ultimate, a follow-up to the 2016 3DS game Monster Hunter Generations. While it’s not the Monster Hunter World port so many were begging for at the turn of the year, it’s a start. Releasing two Monster Hunter games in the west within a six month period to widespread interest shows how much of an impact the franchise has made in recent times. Monster Hunter has evolved from being that wacky monster chasing game from Japan to one that people now sit up and take notice of.